In case you haven’t noticed, the Edinburgh Festival is truly upon us! If you own an iPhone/iPad, you should have downloaded the Fringe Festival App written by Appleton Tower Level 6 residents, Loc8 Solutions. 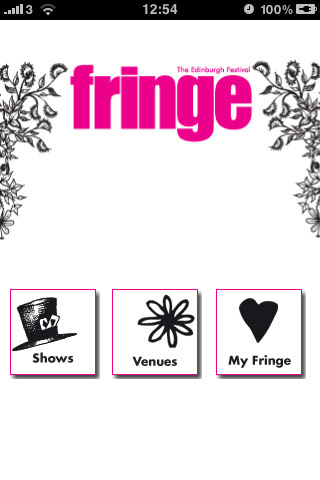 The app contains all the listings, a place to store your fav fringe shows and even though the screenshot doesn’t show it, the app also has a link to the offers from the Half Price Hut. If you haven’t downloaded it, do it now! Incidentally, if you’ve spotted any cool festival shows or been to any that you particularly recommend, feel free to comment below! My sources tell me more than 8700 people have already downloaded the Loc8 app, and the Fringe has only just begun. I’ve also heard that an estimated 100,000 people with iPhones would at some point pass through the festival. Those are some serious numbers. Improvised musical. Different every night. Hilarious, outstanding live performance. are you sure that’s not 1 in 10 for smartphones rather than iPhones?